This week I finally put together the blocks I won last March at my Quilt Guild. Green Irish Chain blocks! I used the webbing method of sewing the blocks together and had it done in under two hours. 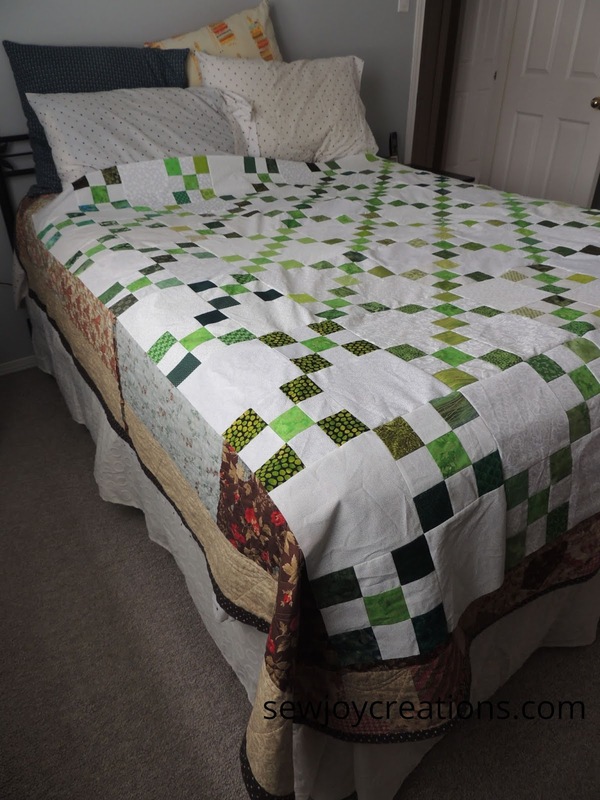 Here is the quilt top on our queen size bed and you can see that it probably would fit a double bed right now. There is definitely no 'drop' going on! Now the question becomes - do I leave it as is and finish it this size? It wouldn't be used on this bed then, maybe gifted? Or put on one of the single beds in the house? 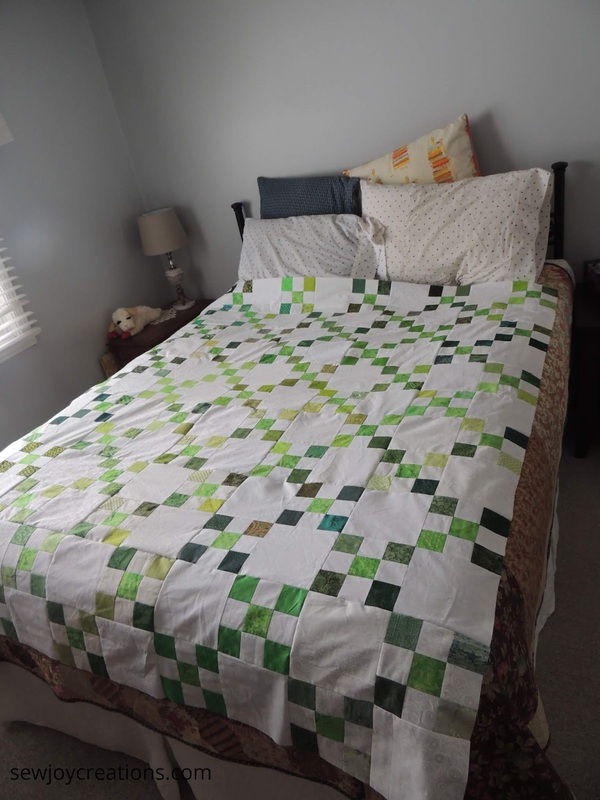 Or do I need the quilt on my bed and should make it larger? I have a few of the nine patches that I could add with a wide white border. I've also thought about a wide border with a winding shamrock applique - but then this quilt top would never get finished! I also thought about a row of rainbow squares inside two white borders. . .
What would you do? Call it done or make it bigger? It is so pretty! I think that I would add a border. Try out the white border with your left over blocks and see how you like it. You could also use it at the current size on a smaller bed. 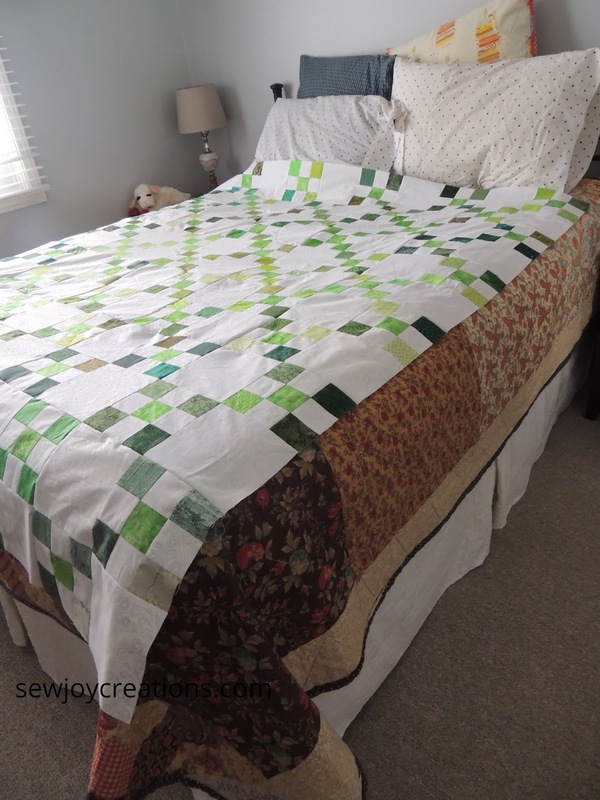 Personally, I like a border on a very traditional quilt pattern. Not a hard and fast rule though. YOu could make more 9-patches to make it larger, or deconstruct some of the leftover blocks to make a frame for the quilt with a border.